This is a picture of the British Crown sent to me by Alan Judge. On the 20th of August, 1966, the British Crown was loading cargo at Umm Said for Kwinana. At 5:30am number 5, 6 and 7 tanks exploded causing the ship to eventually become a total loss. The center castle was totally destroyed, only the Captain and Chief Officer survived. The remainder of the crew abandoned ship from the stern, clinging to the mooring buoys until rescued. In all 13 officers and 6 crew lost their lives. Junior Engineer, Jack Milne Easton. The 2nd Engineer, Gerry Wilson, was an ex-crewmate of mine from the British Light in 1961. He was 3rd Engineer and I was 4th Engineer. Upon my decision to leave the sea at the end of that trip, I had taken a number of photographs of the Engine Room, which included Gerry Wilson. I knew of the explosion in 1966, but never followed up contacting his family. In 2001, when I put up my website, I included a section requesting information about the Crown. The result has been an extremely enthralling search with some most amazing and coincidental contact. sometimes I think more fate than coincidental. I will be documenting all this information in later years, this is just a taste of what I know. 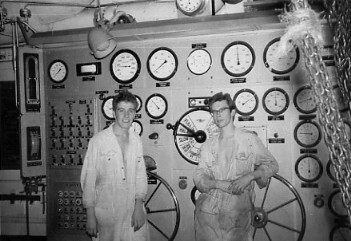 Photograph taken late 1961, in the engine room of the British Light. Fredrick Gerald Wilson(Gerry) 3rd Engineer and standing next to him is an extremely young looking me, 4th Engineer. This photograph of the British Crown burning is taken from Umm Said, probably mid-morning. The mooring lines and anchor cables were cut and she drifted aground still burning, eventually breaking her back. Note the helicopter, slightly to the left of the middle, just above sealine. In June 2002, I managed to get in contact with the engineer who was aboard this helicopter. This is the view of the British Crown on the starboard side, bow to stern, showing the officer's accommodation in collapsed center castle. This is the view forward, from the forward end of the aft deck. A sign of total devastation. Note the aft mast in the extreme left, collapsed and hanging over the port side. 12,000 tons of cargo has been reclaimed from the forward tanks. She is aground at the stern. Her back is broken. The forward tanks have now been flooded to sink the bow section onto the sea bed. The end. The vessel is sealed and finally abandoned. An arabic sign warns "Keep Off". Dec/02, I have yet to find her final resting place. Dec/03, I have located a 1959 engineering apprentice who was at Umm Said when the wreckage was towed away. I believe the destination was a new steel plant built at Umm Said. As yet, precise date is unknown. April/04, I now have a contact (ex-1966 Navigating Apprentice) whose first trip was on the British Merchant in Dec/Jan 1966/67 when she received the 12,000 tonnes of cargo salvaged off the Crown (via the British Loyalty). He informed me that the cargo was then taken to Aden and not refined but "flared" off. April/09, I have had published a short article on the disaster of the British Crown with an oil company newsletter for retired personnel. I am contemplating a similar article for a UK nautical magazine and will release more details as they appear. I have been in touch with the familys of four of the victims and am considering consolidating all of the details I have into a book for future reference.